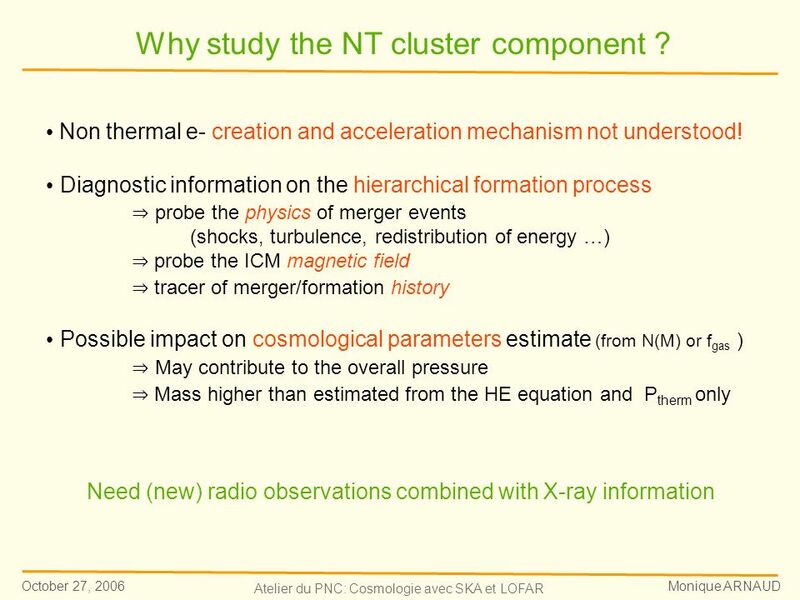 3 October 27, 2006 Monique ARNAUD Atelier du PNC: Cosmologie avec SKA et LOFAR Jones et al, 03 Ritchie & Thomas, 02 Cluster hierarchical formation => Shocks (heat the gas at T virial ) Radio halos/relics detected in un-relaxed (merger) clusters only Problem: ~Mpc size but t life ~10 7 - 10 8 years << t diffusion Recent creation or (re) acceleration by a mechanism at cluster scale Several Models - Thermal electrons accelerated by shocks /turbulence - Non thermal electrons (from above or from AGN/Winds) re-accelerated - Secondary electrons from inelastic collisions of NT protons with ICM Origin and acceleration of the relativistic electrons? 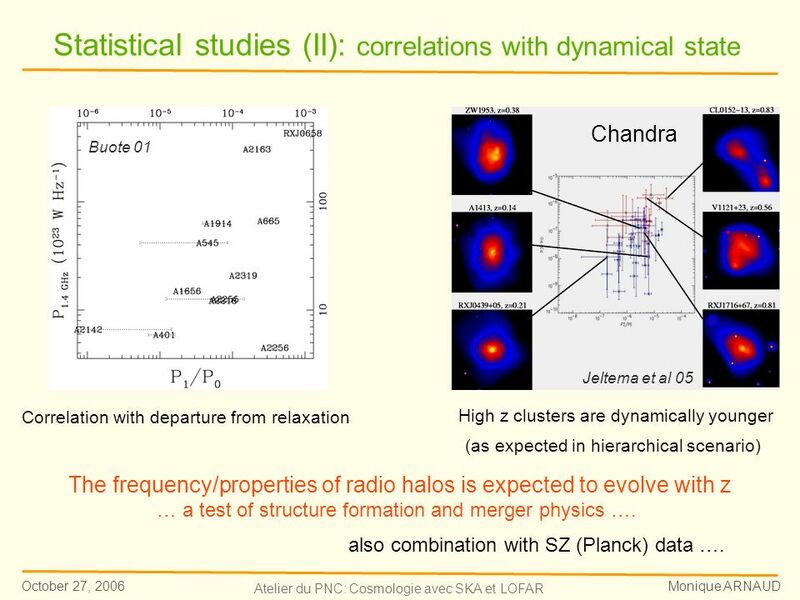 9 October 27, 2006 Monique ARNAUD Atelier du PNC: Cosmologie avec SKA et LOFAR Jeltema et al 05 Chandra Buote 01 Statistical studies (II): correlations with dynamical state The frequency/properties of radio halos is expected to evolve with z … a test of structure formation and merger physics …. Correlation with departure from relaxation High z clusters are dynamically younger (as expected in hierarchical scenario) also combination with SZ (Planck) data …. 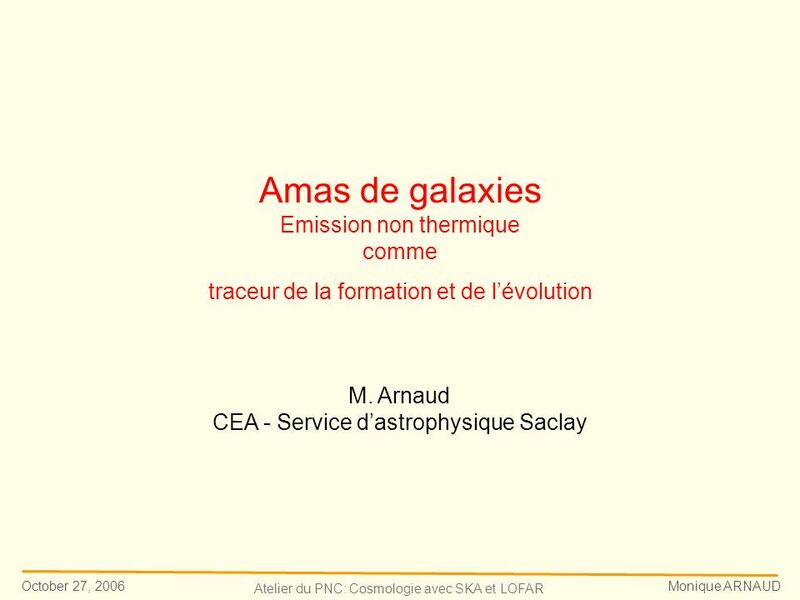 Download ppt "October 27, 2006 Monique ARNAUD Atelier du PNC: Cosmologie avec SKA et LOFAR Amas de galaxies Emission non thermique comme traceur de la formation et de." Cooling and Feedback in Early-Type Galaxies (and Groups) C. Jones, W. Forman, E. Churazov, P. Nulsen, R. Kraft X-ray emission from early-type galaxies. 1 The SZE in the SKA & MILLIMETRON Era. The SZE: Physics high-energy photon Internal High-E electrons - thermal (supra-thermal) - relativistic ↑ Use CMB. May 17, 2010MFPO 2010, Krakow1 Dwarf galaxies and the Magnetisation of the IGM Uli Klein ? 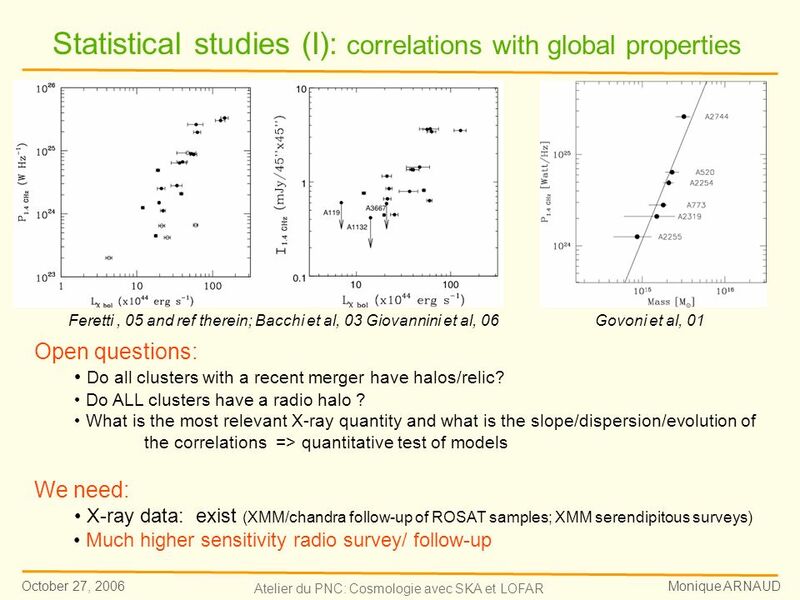 Is there a correlation between the presence of bent radio sources and the X-ray environment ? Oozeer N HartRAO 2010 South African SKA Postgraduate Bursary. 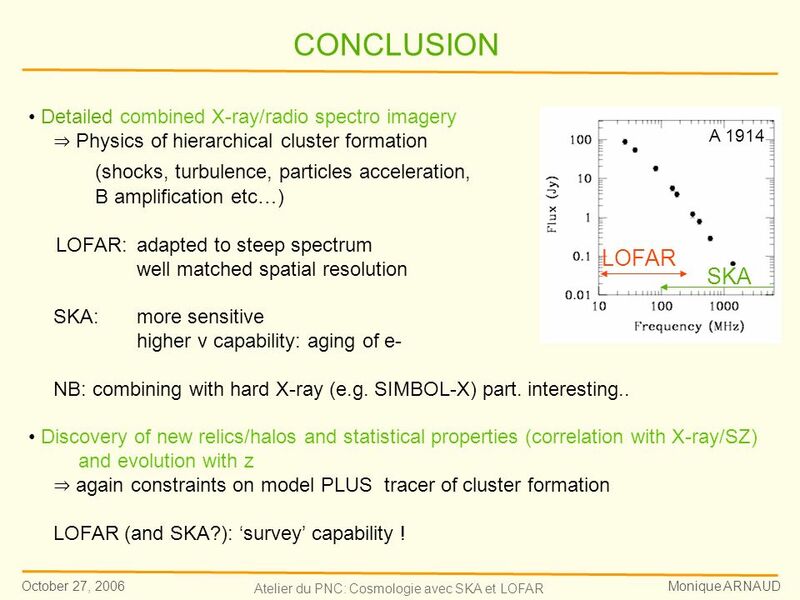 LOFAR & Particle acceleration in Galaxy Clusters Gianfranco Brunetti Institute of Radioastronomy –INAF, Bologna, ITALY. 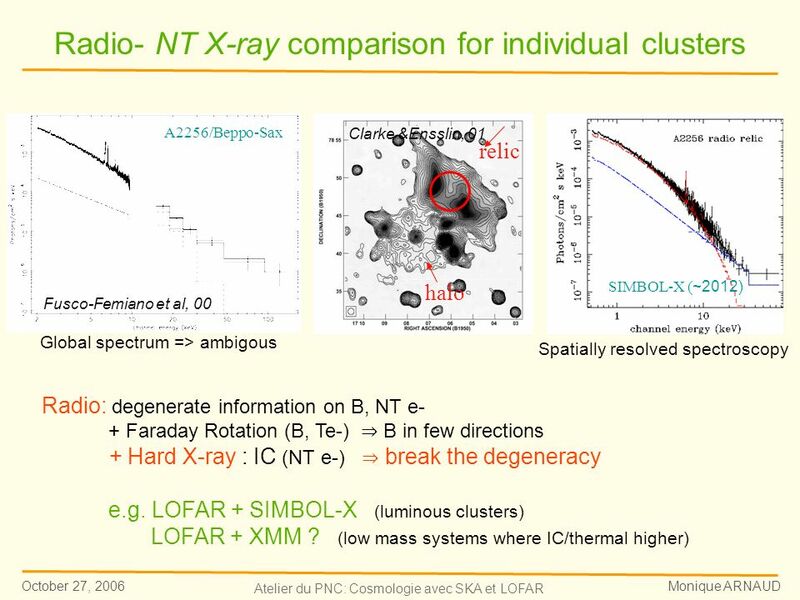 24-28 October 2005 Elena Belsole University of Bristol Distant clusters of Galaxies Ringberg Workshop X-ray constraints on cluster-scale emission around. 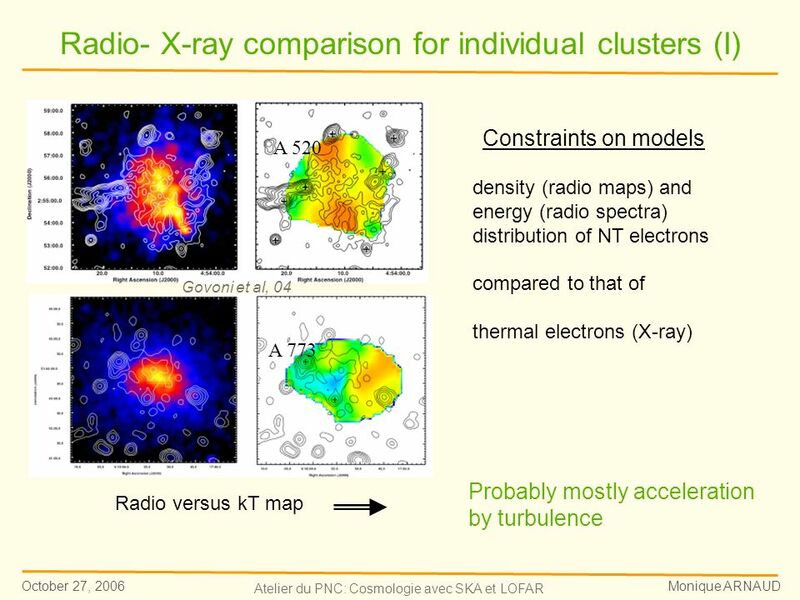 Hard X-ray Emission and IC in Coma and Abell 3667 from Suzaku and XMM-Newton Craig Sarazin University of Virginia A3667 XIS images and radio contours Coma. 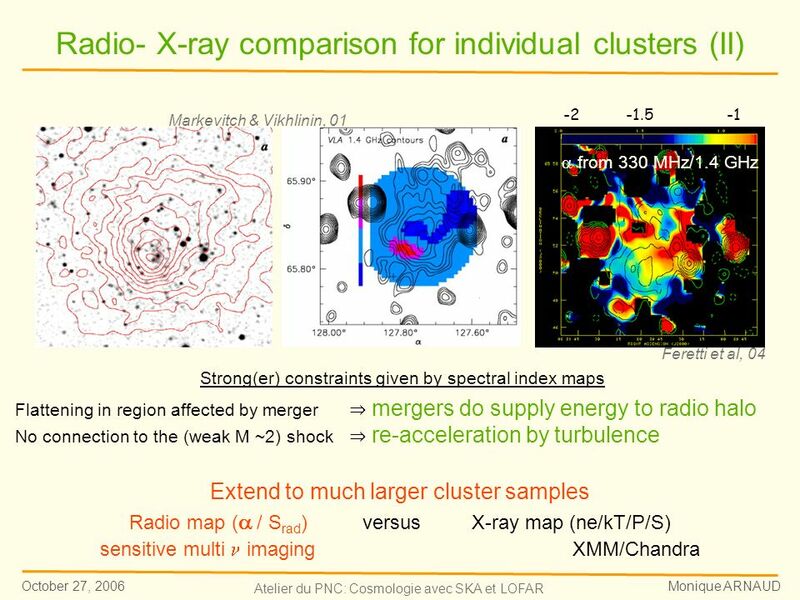 Luigina Feretti Istituto di Radioastronomia CNR Bologna, Italy Radio observations of cluster mergers X-Ray and Radio Connections, Santa Fe, NM February. 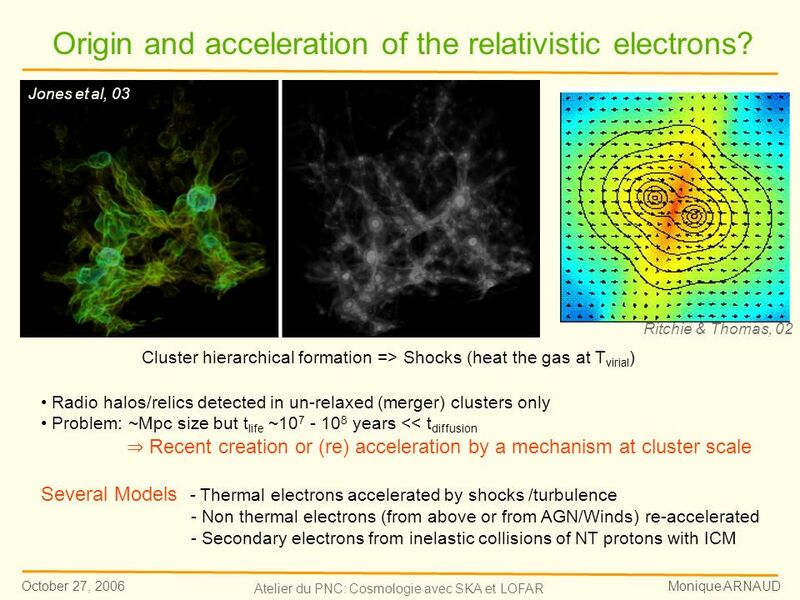 Galaxies Cluster formation : Numerical Simulations and XMM Observations JL Sauvageot *, Elena Belsole *,R.Teyssier *, Herve Bourdin + Service d'Astrophysique. Radio halos and relics in galaxy clusters. NGC315: giant (~ 1.3 Mpc) radio galaxy with odd radio lobe (Mack 1996; Mack et al. 1998). precessing jets (Bridle. Ben Maughan (CfA)Chandra Fellows Symposium 2006 The cluster scaling relations observed by Chandra C. Jones, W. Forman, L. Van Speybroeck. 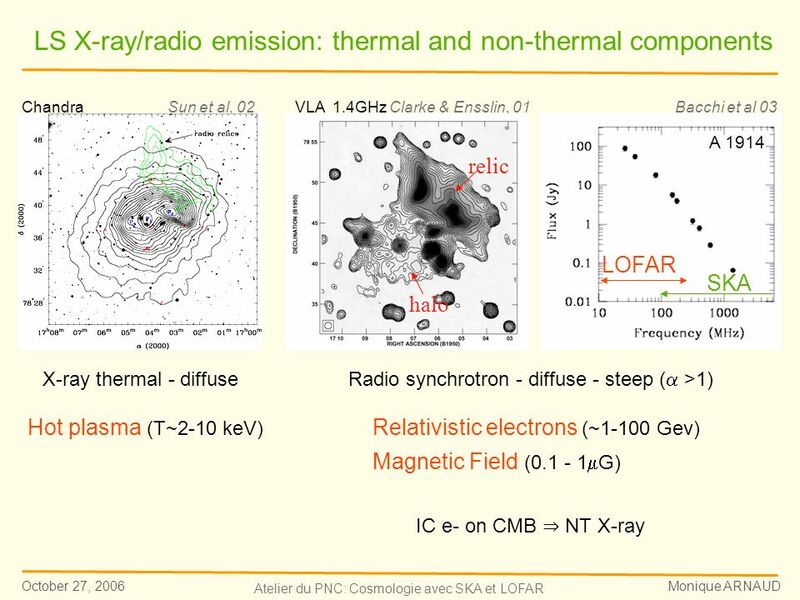 Hamburg, 18 September 2008 LOFAR Wokshop1/44 Thermal and non-thermal emission from galaxy clusters: X-ray and LOFAR observations Chiara Ferrari Observatoire. Contamination of the CMB Planck data by galactic polarized emissions L. Fauvet, J.F. Macίas-Pérez.